With flashware discover in a few moments the new products of the vape to come! On this edition we present you a podmod: Le Frozen SDL Pod by HSFC. The Frozen SDL Pod by HSFC is a podmod of rectangular size rather compact and design. Aesthetically successful, the new FMCC kit presents several originalities as its different two-tone coating. Entirely designed in zinc alloy and polycarbonate, the Frozen SDL Pod is not a model that emphasizes discretion. Equipped with a monstrous internal battery 2500mAh, this new kit focuses on endurance and innovation. In an original way, FMCC invents the SDL, a new concept of vape between MTL and DL that allows according to the manufacturer to gently inhale and keep a little more steam in your mouth without losing power. The battery of the Frozen SDL will be accompanied by a pod with a maximum capacity of 5 ml and equipped with a X1 mesh resistance 0,9 ohm (usable between 12 and 19 watts). The pod will be protected by a dust cap and the filling will be done simply by a lid located under the capsule. Finally, the Frozen SDL Pod has multiple protections (short circuits, cut-off ...). RRP : 35 Euros approx. FLASHWARE: Ghost Pod 350mAh (ATVS) With Flashware discover in a few moments the new products of the vape to come! On this edition we present a podmod: The Ghost Pod 350mAh by ATVS. 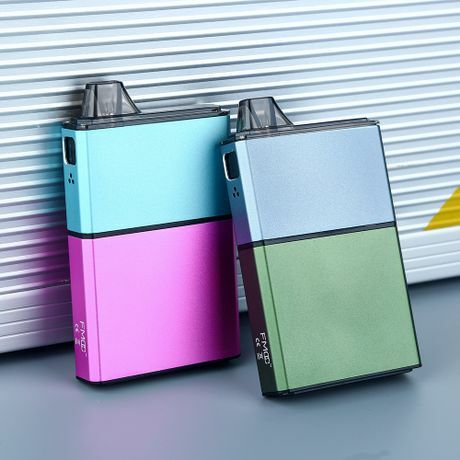 FLASHWARE: Asteroid Pod 420mAh (Think Vape) With Flashware discover in a few moments the new products of the vape to come! On this edition we present a podmod: The Asteroid Pod 420mAh by Think Vape.